This directory contains information and documents about Emma Terry, and her children. She was the third wife, and second formally married wife (but unfortunately, and very likely unknown to her, bigamous wife) of Anthony (Jacques) Clarke/Cheeper (1837-1918). For further details of Emma’s very interesting husband Anthony, including his families with other wives, see the AJCheeper/Clarke directory. 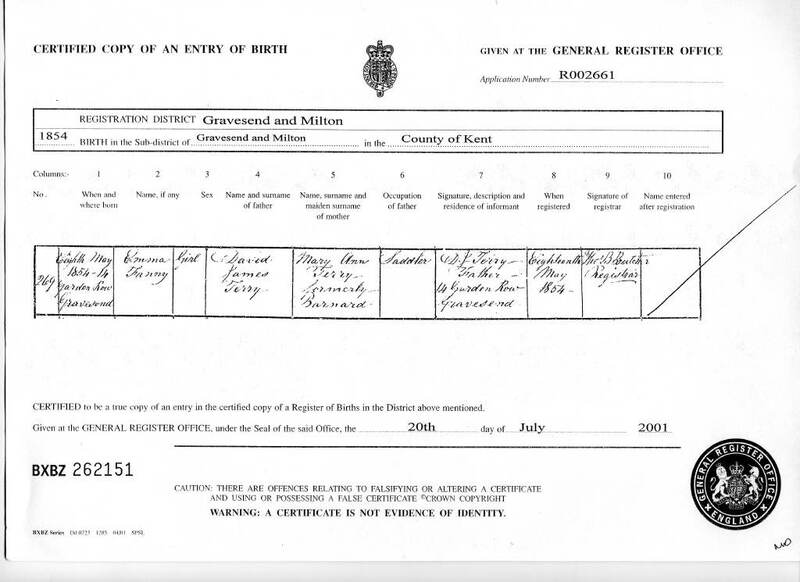 Emma's birth certificate shows that she was born on 8 May 1854, at 14 Gordon (Gurden?) Row, Gravesend, Kent. Her father was David James Terry, a saddler, who is visible in the 1881 and 1891 censuses. Her mother was Mary Ann Terry, formerly Barnard. In the census of 1881, aged 26, Emma was shown as a Companion to Mary in the Wanless household in Ealing. Mary was presumably chronically ill during this time, given that the cause of death on her death certificate stated Brights disease, 4 years duration. Mary died on 5 Mar 1882. 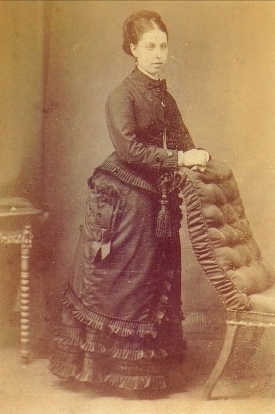 Given the birthdate of their first child together, Emma appears to have pregnant to Anthony within a fortnight of Mary Wanless's death. Emma and Anthony were married a mere 3 months later, on 17 June 1882, in the Registry in Bromley, Kent. 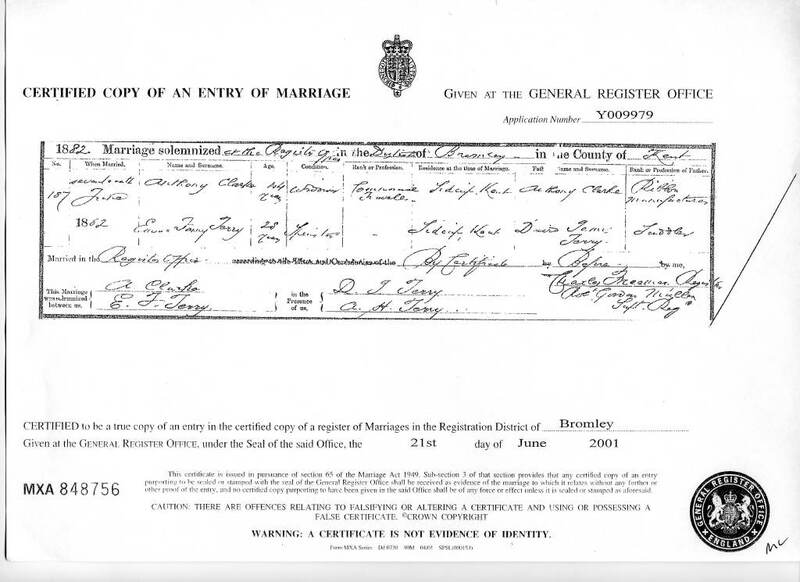 Mary's death certificate would presumably have been sufficient to establish that he was free to marry, despite the fact that he was still married to Catherine Spilsbury (who died 24 years later, only a few months before Emma did). The marriage certificate shows Emma as being 28, and Anthony as 45 (actually 44), and a commercial traveller. His father's name is shown as Anthony Clarke (actually Cheeper), ribbon manufacturer (as Anthony Cheeper senr. has been). Their address is shown as Sidcup, Kent (on the ESE edge of London). The witnesses appear to be Emma's father (D.J. Terry) and another Terry, A.H. He was known to Emma as Anthony Clarke. There is no evidence that she was ever aware of the Cheeper name (although one of her daughters was aware of the Jacques name). During the c. 10 years of their marriage, Emma and Anthony appear to have lived at at least 4 residential addresses. Within 2-1/2 years of the marriage, i.e. by the beginning of 1885, he appears to have been co-habiting with another woman as well. But Anthony also appears, albeit under the pseudonym Robert, in Kate Davidge's household. She and their already five children had recently moved into Brockley, Lewisham, a few blocks across the railway line from the home that Emma and her six had just left. They may well have overlapped as neighbours. Anthony left Emma some time after the census in April 1891 (by which time he was 54, and had been in a marital relationship with the other woman for at least 7 years, and had fathered 5 children by her), and very probably before the 1901 census (by which time he was 64, and when he is not recorded in Emma's household). We've found no evidence of a divorce. In the April 1901 census, Emma was 46, and her household was at 9 Churchill Rd, Gravesend, Kent. Her 4 children were with her, aged 18, 17, 14 and 12. Emma died on 22 November 1906, at the age of 52. 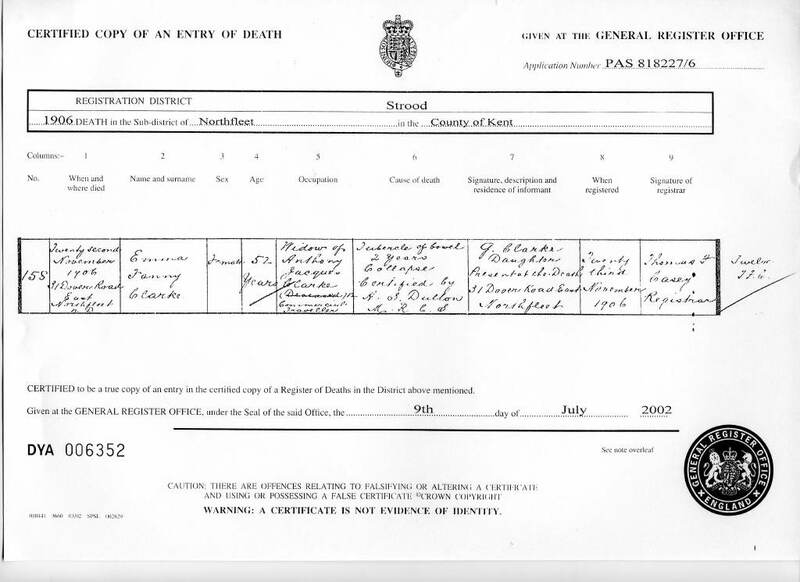 Her death certificate shows her address as being 31 Dover Road, East Northfleet, Strood (which is in Kent, but on the northern side of the Thames, opposite Rochester). She was shown as the widow of Anthony Jacques Clarke, deceased (but the word 'deceased' is then crossed out), commercial traveller. The informant, who was present at the death, was Gertrude. So the 'deceased' might have been bitter, wishful thinking. Winifred was born on 21 December 1882, at Welton Garth, Sidcup, Kent. The informant was Emma. The father was shown as Anthony Jacques Clarke. In the 1891 census, at age 8, she is with her parents and siblings at 3, Downs View Villas, Beach Street, Deal, Kent. 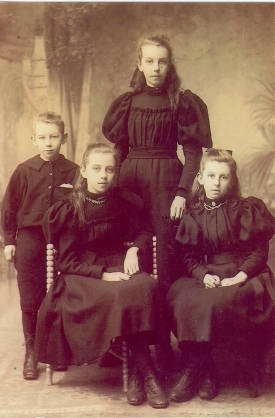 In the 1901 census, at age 18, she is with her mother and Terry-Clarke siblings at 9 Churchill Rd, Gravesend, Kent. She is shown as single, and a dressmaker. In the 1911 Census, she appears as Winifred Clarke, 28, Single, Staff Nurse at South Eastern Hospital, Avonley Road New Cross SE London. She may have been a nurse, although perhaps only during WWI? The family tree that Geoff Clarke acquired from Will Wakeham indicates that she married Bernard HOBSON. Anne later found the entry in the Dec qtr 1918 Newton Abbott (RD) 5b 325. Newton Abbott is in Devon, south of Dartmoor. By that time she was almost 36. Bernard was b. 1878, so 40 at the time. He had been a Lt RNR (Royal Naval Reserve) 19.11.1918. Will's family tree says they lived in Sidcup, and had no children. Anne found a death entry for Bernard Hobson in the Jan qtr of 1964, aged 85, Croydon 5G 126. Will's family tree says she d. 16 Nov 1972, Croydon, so aged 89. Anne found the entry in the Oct qtr 1972, at Croydon 5A 2164. 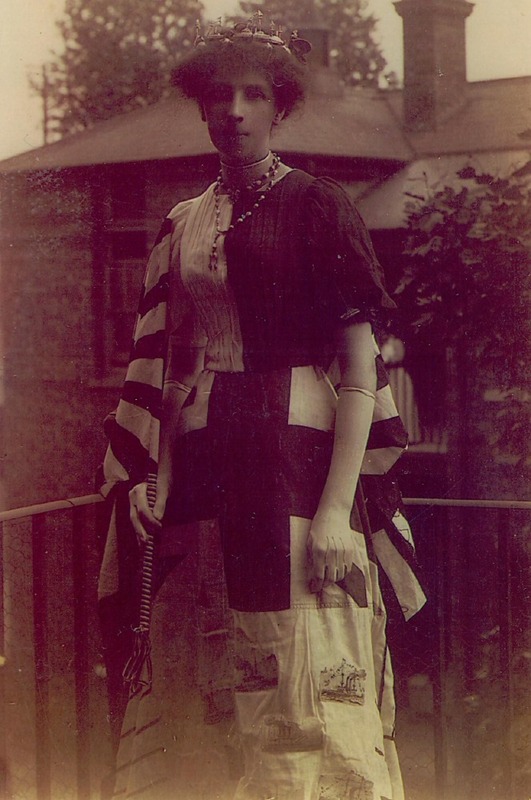 Gertrude Mary was born on 9 March 1884, at Helstonleigh, The Avenue, Berrylands, Surbiton, Surrey. The father and informant was shown as Anthony Clarke. In the 1891 census, at age 6, she is with her parents and siblings at 3, Downs View Villas, Beach Street, Deal, Kent. In the 1901 census, shown at age 17 but actually 16, she is with her mother and Terry-Clarke siblings at 9 Churchill Rd, Gravesend, Kent. She is shown as single. 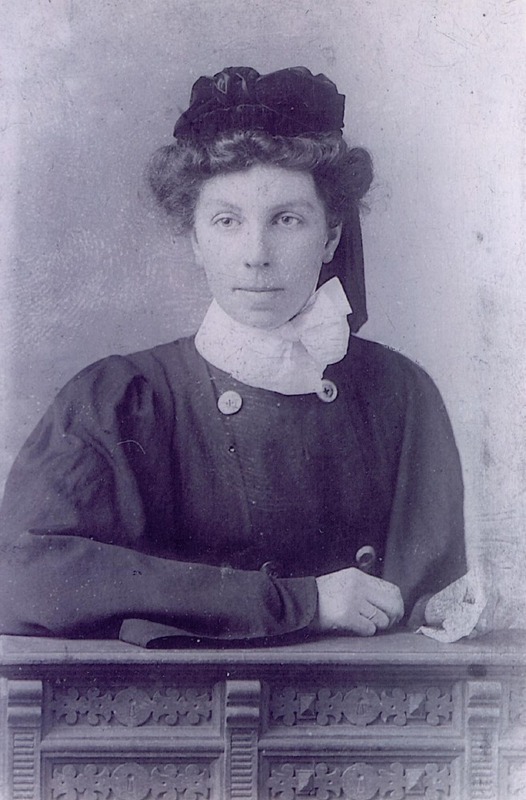 Gertrude was the informant on her mother's death certificate, on 22 November 1906, at age 22. She was living with her mother, at 31 Dover Road, East Northfleet, Strood. Gertrude married William Ellis WAKEHAM, Sep qtr 1909, Poplar 1c 838. (We originally thought it was Dec qtr 1908, when Gertrude was 24, and at Winchester; but Carol Mohr in Vancouver found the entry). William was b. 27 Mar 1884, so they were both 25 when they were married. In the 1911 Census, they were both shown as being 27 (just), he a carpenter and joiner, and born in Limehouse, London. They were at 189 Brinswick Rd, Poplar (near Bromley). The first photo above suggests that she may have been a nurse, maybe during WWI. On the other hand, she had 2 children before it started, and 2 more during the War. William d. 1971, aged 86. Gertrude d. 9 Dec 1977, in Morden, aged 93. George was possible a sufficiently distant relation of her mothers? Leslie W. was born on 15 March 1889, also at 4 Braxfield Rd, Brockley, Lewisham. The informant was Emma Clarke, and the father Anthony Clarke. In the 1891 census, at age 2, he is with his parents and siblings at 3, Downs View Villas, Beach Street, Deal, Kent. In the 1901 census, at age 12, he is with his mother and Terry-Clarke siblings at 9 Churchill Rd, Gravesend, Kent. 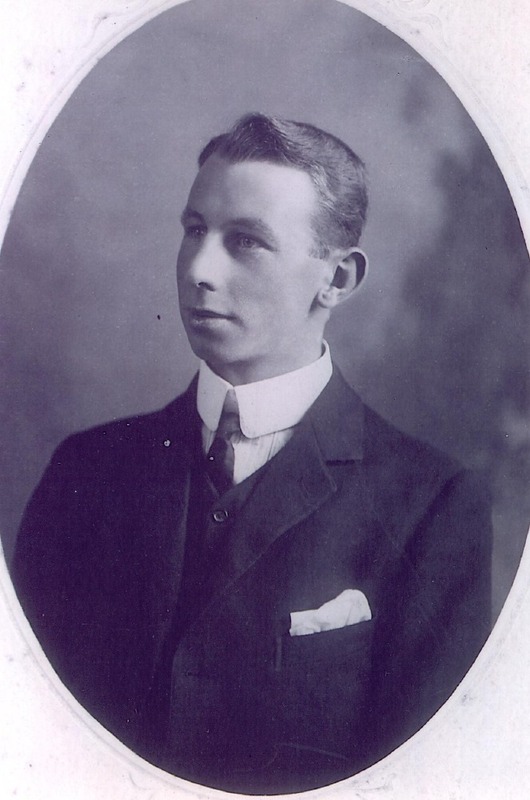 In the 1911 census, at age 22, he is a Police Constable, visiting at 84 Cecil Rd, Gravesend. (The Durham family he was visiting seems to be otherwise unknown, so perhaps he was boarding there). He married Rose A. Bowers (?1892-1963?68?) in Dec qtr 1913, at 24, Portsmouth 2b 1117. (At an early stage, we'd surmised connections with a Dalton, but this is probably spurious). The family appears to have been in Portsmouth at least 1913-19, but in West London probably from some time in the 1920s. The Portsmouth connection is of interest to Anne and me, because our Clarke line (4.6) was in Hampshire, apparently quite separately, from about the same time, and firmly in Portsmouth from 1916. The family tree Geoff Clarke got from Will Wakeham indicates that Leslie and Rose both died in 1969, in Ruislip. They were in Southport (Merseyside) in 1941, when Cecil was 27. They were in London in 1946/47, when Cecil was 32. (The surmise is based on the children's names. The entry is not local, and shows second initial K.).